We recently hosted a seminar from Dr Arnold McKinley of UCL on the use of micro-grids and virtual power plants in South Australia. Dr McKinley has very kindly supplied his slides from the talk [PDF] and written us this blog covering the topic of his talk. Australia, an island/continent as large as the continental United States, has six proper States and two Territories. All of them enjoy a lot of sun, but also high electricity prices, some of the highest in the world. That’s causing a stampede toward rooftop solar; indeed, many people are leaving the gird entirely, because they can. The growth in off-grid residential has been almost 16%/year for the last 10 years. One of those states, South Australia, suffers under the highest prices in the nation, due to tight local supplies and high interconnect prices. Over the last three years, three large coal power plants were closed due to age, partially replaced with wind farms, and the deficit in supply is forcing up the price. The utility and South Australian government response to all this rooftop guerilla solar has been traditional: new centralized power plants. Good on them, since these plants are noncarbon based wind and solar farms, but what’s their effect? Maybe not the best thing; maybe there’s another way of thinking about it. Off-grid solar reduces demand; that is good for reducing carbon-based power coming over the interconnect, but bad for electrical tariffs, since the utility simply raises its prices to pay for the overbuilt network. And rooftop solar reduces demand in the middle of the day, cutting into the profits of the solar, wind and NG gas generators. Large scale solar thermal and wind plants will neither prevent the spread of rooftop solar, nor prevent off-gridding. Of course you can sell excess power on the spot market for the interconnect, but that’s not really the central problem facing the South Australian grid. Does SA need a grid at all? If so, what kind of a grid and who does it serve? And what role do the local providers provide in this brave new world of rooftop solar? South Australia is rather unique; it hasn’t much industrial load on the grid. Maybe 20% of demand is industrial processing and most of that is in the far north with the mining industry (most of which, by the way, is off-grid). Only 10% of demand in the populated sections of the state are industrial loads. Particularly why would you want this if you can generate it on rooftops more efficiently and at less cost? I offer that we ought to be thinking of the grid as a two-tier network, where large scale power plants serve high temperature demand and local generation serves low temperature demand. That the system is more robust, secure, more efficient, and less costly, if constructed of small local networks of generation tied to demand through peer-to-peer trading. That the grid is capable now of supporting industry without building out more centralized power plants. 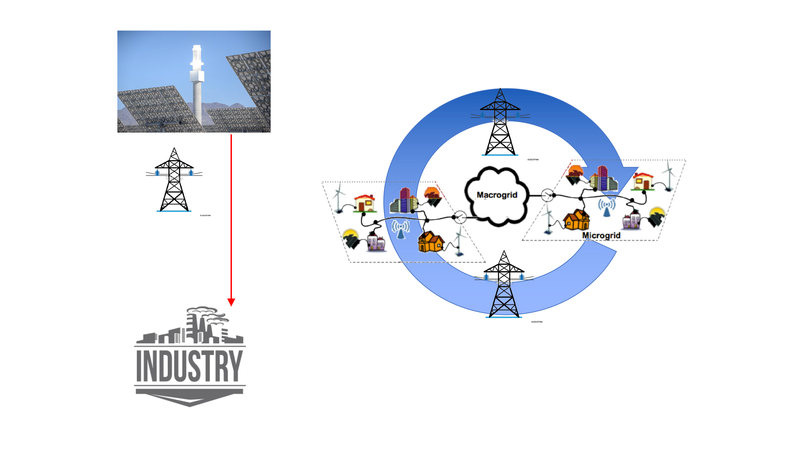 We ought to be designing embedded virtual power plants that can decouple when the main grid comes under stress. We ought to be thinking about the role of providers in transitioning to embedded networks, and we ought to support the new peer-to-peer trading enterprises that will more than likely supplant the spot market in the not too distant future. Dr. McKinley is a Teaching Fellow in UCL’s Department of Electronic & Electrical Engineering. He worked at the Institute for Energy Studies at Stanford University and at the Centre for the Study of Social Policy at Stanford Research Institute (now SRI International) in the 1970s. In the early 1980’s he taught at San Diego State University in the departments of Physics and Electrical Engineering. For the next 25 years, he worked on contract and internally for various scientific laboratories and institutions, including Apple Computer, X-Rite technology Centre, Minolta Laboratory Systems, the Centre for Research in Mathematics and Science Education, and the National Science Foundation. In 1995 he founded MetaMind Software to develop educational software for engineering and science students. In 2005, he joined Apparent, where he led program development for “EnergyREView”, a browser-based energy monitoring system for renewable energy systems. He later provided White Papers on the basic mathematics used to explain power factor correction using the company’s micro-inverter product. He participated in two patents with the company. While at the Centre for Sustainable Energy Systems at the Australian National University in Canberra from 2010, he studied the Australian electrical grid system and is currently working on issues concerned with the integration of renewables on the electricity grid in the US, Australia and Europe. His main interest is micro-grids and embedded networks. Previous Are the electricity system design decisions going to change when the climate changes?